(4) Extra set of change parts for second box size. 4. Suitable usage: medicine, foodstuff, cosmetics, etc, packing into square carton. 1. Smallest carton size: 60m/m x 20m/m x 20m/m. 2. Largest carton size: 200m/m x 80m/m x 80m/m. 3. 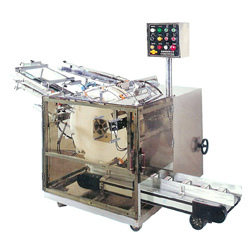 Production speed: 20-50 carton per min. 4. Power supply: 220V; 50/60 HZ, single phase. 5. Motor horsepower: 1/2HP AC motor. 7. Machine measurement: L 1900m/m x W 1450m/m x H 1450m/m. 8. Machine weight: 500 kg.